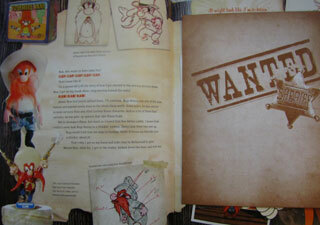 Over the past few years, we have seen a number of the “Treasury” style of books. These impressive hardcover volumes feature not only photographs and other images concerning your favorite subject of choice, but also an assortment of knickknacks hidden away in various pockets, or pasted right into the pages. 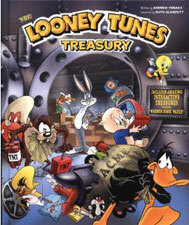 We have already been treated to Treasury books for Star Wars, DC and Marvel Comics, and Hanna-Barbera cartoons, and now Running Press has provided us a book that we cartoon fans just knew had to be in the works: The Looney Tunes Treasury. With eighty years of history to draw upon, and a historical wealth of merchandising of these characters, this volume certainly seemed to have loads of potential. The volume looks impressive enough, with 144 pages behind a cover with a raised logo and spot gloss on the characters. Fans often quibble about whether any new drawings are on model, and overall I’d have to say that the cover does a good job of faithfully representing the classic Looney Tunes stars. Only Daffy looks perhaps a little off-model (and perhaps Elmer as the image continues onto the back cover), but overall these look like the characters we have come to love, even if over the years they have become standardized by current marketing model sheets and less so by their classic cartoon appearances. The sturdy, red “obi” type of strip on the back cover gives the book a nice touch of class, even if it obscures some of the artwork. (There is no dust jacket.) I do like how the cover gives a literal interpretation to the “vault” idea, a motif that is carried into the interior cover. Before even getting to the title page inside, we are offered some vintage Wile E. Coyote storyboard images, a promise of things to come. The title page itself has a pop-out image that I had to discourage my kids from yanking on. Ruth Clampett, daughter of director Bob, contributes a foreword. Ruth is an appropriate choice not only because of her lineage, but also due to her own resume, as the former head of design for the Warner Bros. Studio Stores and current head of the Warner Bros. fine arts program. Next up is an introduction by the book’s author, Andrew Farago, curator of San Francisco’s Cartoon Art museum. Again, he seems to be a natural choice to help with this project. I actually felt a little sorry for Farago while looking through this book, though, and here’s why: Someone had the bright idea to have each Looney Tunes character write about himself in his own chapter. It sounds like a cute idea, but… in practice it can be tricky to avoid inanity. Now, if this were a kids’ book, the idea might have been pulled off easier; but as something aimed at collectors, this can come off as a pretty dopey idea. A collector buys this book for the images and memorabilia on display, and maybe even some insight into the creation of the cartoons. A collector does not particularly wish to hear cartoon characters making faux autobiographical comments. Maybe it’s just me, but when I first paged through this book, I lost a lot of enthusiasm as I read excerpts that made me wince with discomfort. I also wondered how committed the writer and editor were to the conceit when Elmer Fudd lapses from his usual lisp into regular talk as his chapter proceeds. I mean, if you’re going to do this, then I think you should at least go all the way. If it starts to sound dopey, don’t blame Elmer’s lisp; blame the idea to write it that way in the first place. Later, as you start to read the Tasmanian Devil’s thoughts, in the form of diary entries, you realize that the whole concept is really falling apart. Really, just think about it. The Tasmanian Devil writing perfect English into his diary. Does that sound right to you? Still, once I actually read through the book, the concept did grow on me. As the characters prattle on, they do actually divulge a little information on their development. Of course, since each character has his own bias, you’re not really getting the straight story, and certainly not many details. On the other hand, I began to realize that there are other books that offer a true history or character analysis. This book is just for fun. To be honest, though, I do wish that they could have just let the images speak for themselves, and not had so much space devoted to the text, which is sometimes cute but overall of little value. After all, we’re buying this book for the art, not the words, right? Unfortunately, the art side also falls a little short, mostly on the pages with the most text. 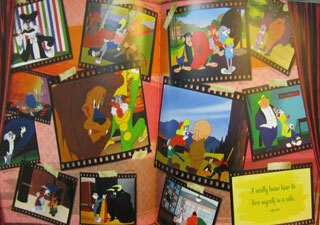 Typically, the text pages include stills from the cartoons, or newly drawn re-creations of classic scenes. Again, that’s not really what I chiefly wanted out of this book. Overall, there is a stunning lack of cool factor in the book, with a distinct lack of what I was expecting— which is, to say, rare art or photos of memorabilia. For example, Witch Hazel actually gets two whole pages of her own in the book, which consists of a cel set-up and a production sketch… and a whole lot of text, including a couple of magic potion recipes that Farago made up. 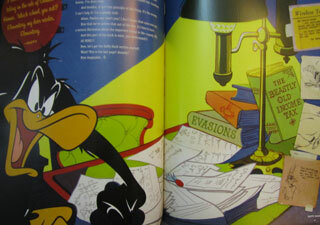 One would think, that in 80 years of Looney Tunes greatness, that those two pages could have yielded a whole lot more. Miss Prissy’s two pages (believe it or not) yield only a still and a cel to go along with the silly text material. Fortunately, other chapters fare a bit better. There is still an over-reliance on stills, but one cannot complain about all the lobby cards, model sheets, and various storyboards and sketches on display. To gain the “Treasury” moniker these days, however, one must bring out the memorabilia, preferably with removable goodies! And here, we do find some of these. 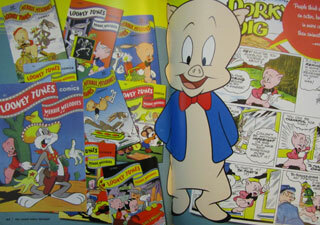 Wile E. Coyote’s chapter has a 16-page Acme Catalog pasted into it, and we get mini-sized comics reprints for Porky Pig and Tweety And Sylvester. Daffy Duck has some stickers in his chapter, Yosemite Sam has a “wanted” poster folded up in a pocket, and Speedy’s chapter gives us some removable postcards. The disappointment comes with the realization that many of these items are just hokey things made especially for this book, and not neat reproductions. The comics are vintage, sure, and Bugs Bunny’s chapter has a script for Rabbit Hood; but past that there isn’t much here for true collectors interested in the vintage stuff. Worse, there are many pages in a row that go by without anything too special at all. It just feels sort of empty. Or is vacuous the word I’m looking for? I really want to love this book, but find myself “kinda liking” it instead. Like a bad car salesman, it makes a great first impression, but spending more time reveals a shallowness that can’t help but feel like a letdown. To be fair, more casual fans will likely find this book a delight, but anyone who owns some of the better books out there on the subject won’t be terribly impressed by this one. The hardest thing to accept was that so few photographs could be found of vintage merchandise, which was what I most hoped to see. 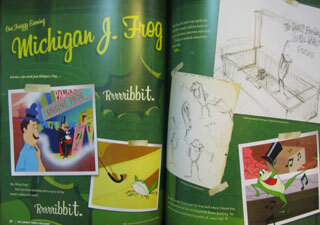 Seriously, there are only about six photos or merchandise in the whole book, including one page of comic book covers. What we have here is a picture book for someone wanting a breezy read and to see some stills or production art from childhood favorites, but not much more than that. There’s nothing inherently wrong with that, but the book seems set up to do so much more. I don’t wish to sound too negative. The design of the book is extremely attractive, and anyone paging through it will definitely be impressed by the layout. The designers did a wonderful job putting it all together; I only wish they had more to work with. At a discount, this book could make a fun read. At full price, I would hesitate. 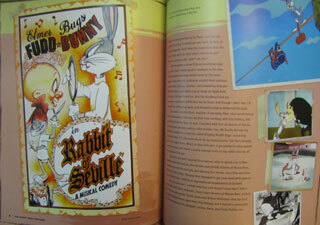 If you want a great Looney Tunes art or history book, I have several others I would recommend first.